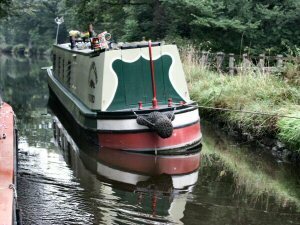 THE Huddersfield Narrow Canal was closed at the end of last month as it was too silted-up for boats to proceed. It is still closed, as Canal & River Trust state that it is unable to clear the lock—as there is too much silt! The Trust tell us that heavy rainfall and flows into the canal have caused a large amount of silt to be deposited in the lock chambers, at two locks—26E and 25E, that of course does not allow the locks to be operated. Attempts have been made the Trust tells us, to clear the silt, but not how this has been achieved. It is however understood that there is so much silt in the waterway that the dredger is unable to get to the two locks. The waterway has always been subjected to problems with silt owing to the close proximity of the locks to each other and the two times we have navigated the waterway we have had problems with the excess of silt even with a shallow draughted boat. The photograph shows a boat we were once following that became grounded on the silt every time a lock was emptied!